Danny O’Mahony is a traditional musician from Ballyduff in North County Kerry. He grew up playing music with the older generation of musicians in his locality. His late father Mick had a very positive influence on Danny as a young child and nurtured his keen ear and interest in traditional Irish music. Both imaginative and fearless in his interpretation, Danny’s musical style is expressive and deeply personal, and reflects his affinity with the music of past masters. His performance abilities have been acknowledged through winning Junior & Senior All-Ireland titles and graduating from the University of Limerick with a Masters in Performance. In 2013 Danny was awarded Top Button Accordionist (US, IRE, EU, UK) by the Irish Music Association in America. 2011 saw the release of Danny’s long awaited and critically acclaimed debut solo recording ‘In Retrospect‘ accompanied by Patsy Broderick on piano, Cyril O’Donoghue on bouzouki and Johnny ‘Ringo’ McDonagh on percussion. 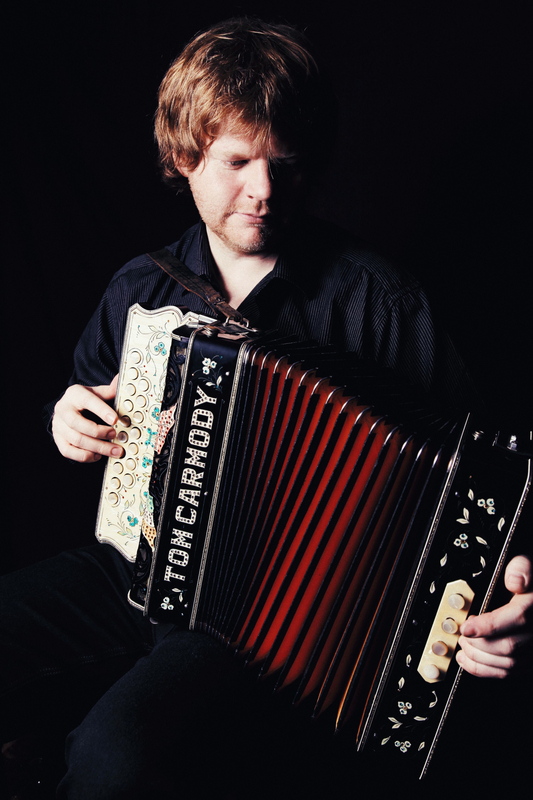 He collaborated with concertina maestro Mícheál Ó Raghallaigh in 2012 and released their duet album, aptly titled ‘As it Happened’. This features Danny & Mícheál playing unaccompanied in the comfort of Mícheál’s kitchen. ‘As it Happened’ was awarded Instrumental Album of the year by LiveIreland Music Awards. O’Mahony has immense experience in Traditional Irish Music tuition over a period of almost three decades. He is a guest tutor in various University Irish study programmes both nationally and internationally and is a registered tutor with the Kerry Education and Training Board. He frequently attends festivals and summer schools, at home and abroad, as guest tutor, lecturer and performer. Clifden Arts Festival ‘Music & Poetry’ | with poets Gabriel Fitzmaurice, Michael Coady & Tony Curtis. Danny’s current area of special interest is the music of his relative Tom Carmody and the James Morrison Instrumental Quartet. Danny performs regularly on RTÉ, TG4, RTÉ Radio One, Lyric FM, and RTÉ Raidió na Gaeltachta. “In Retrospect is an instrumental fusion of generational tradition where nostalgic tones are enhanced by the innovative instrumentals of a serious talent. A debut delight” – Irish Music Magazine, September 2011.